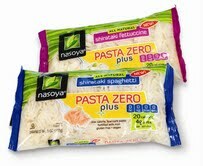 I was recently contacted by a PR person offering for me to check out Nasoya's Shirataki Noodles. I'm always happy to try some new foods and so I offered myself up as a taste tester. After receiving the coupons for Nasoya's noodles I went to a few shops looking for the company's products. I had some trouble finding the noodles but that is partly my stupidity as their is a product locator right on the website. Once I did find the Nasoya noodles, I bought the Shirataki Spaghetti and and Shirataki Fettucine to vary my choices. While the PR representative had mentioned that these products were low calorie, but I was shocked to read that the whole bag was 40 calories! How great is that? You can get your pasta kick while also keeping it low calorie and low carb. Of course, the number of calories wouldn't matter if it didn't taste good. Fortunately, Pasta Zero shirataki noodles are great. The pasta isn't sold like other pastas in that it isn't dry, instead it is sold wet They are simple to prepare; I prepared them by straining them and then cooking them in a skillet with some pasta sauce. The noodles soak up the flavor of pasta sauce really well. The only downside to Nasoya's shirataki noodles is that, to me, it seems that the bags can only serve one person. While you could split the bag into servings for two people but doing so would make the pasta more of a side than anything else. Nasoya's website has a lot of recipe ideas that I'll definitely be using in the future to spice up the pasta. All in all, I will definitely buy more Nasoya Pasta Zero as the product is a great way to eat pasta while watching calories and carbohydrates. Hi I prefer Miracle Noodle brand of shirataki noodles..they have ZERO calories and zero carbs. I have found fantastic recipes on their Facebook page which people share and in their cookbook. I usually order online www.miraclenoodle.com or buy at local Whole Foods. I find I can have my pasta and keep my weight maintenance goals as well. Hope this helps!! Enjoy.